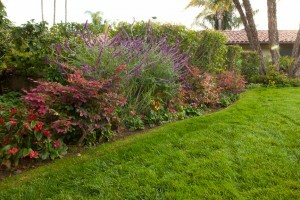 Soil Amendments and Low Maintenence Gradens | Santa Barbara, Ventura | Down to Earth Landscaping Inc. This week begins a series of blogs that will spotlight methods for creating a low maintenance garden. This week’s topic is “How to Use Soil Amendments to Create a Low Maintenance Garden”. These blogs will provide you with a few tips on how to transform your garden into one that essentially takes care of itself. Who knows, you may be closer to “going low maintenance” than you think! In an earlier blog dated March 14, 2012 we discussed the importance of amending soil. Proper soil preparation and amendment is the starting point for having a healthy landscape. As a matter of fact, the quality of soil also directly impacts the maintenance required in your yard’s landscape because well amended and prepared soil keeps plant material healthy and strong and the result is a low maintenance garden that will require fewer instances of fungicide, fertilization and dry soil. • Deep rototill or “fluff soil” until it is soft and ready for planting. • Use 3 to 4 different types of soil amendment materials. • Use a slow release fertilizer that is organic based for soil health and insect control. • Remove old elements such as roots, asphalt, and rocks. • Prepare soil for irrigation. • Add a 1 to 2 inch layer of organic bark for root protection and to cut back weed material. In Santa Barbara, many of our gardens are situated close to the ocean. The marine layer near the ocean can cause roses to mildew and rust but with proper soil amendment you will literally protect roses from the ground up, protecting them from insects and mildew. 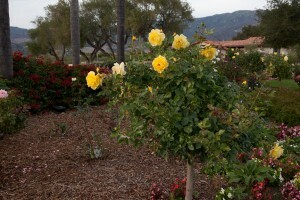 Roses growing in healthy soil are infused with the nutrients necessary to fight off all kinds of disease. This is true of all kinds of plants. If a plant’s root system remains healthy, leaves remain green and shiny and blossoms are larger and more vibrant. It will also make them more resilient to fighting natural predators, like white fly, earwigs and snails. Much like human beings, if a plant’s core system is healthy, the rest of the body is strong and can fight off disease. Amending soil before planting is analogous to taking good pre-natal vitamins during pregnancy. Well amended soil is giving your baby plants their pre-natal vitamins. Maintaining your soil is just continuing your garden’s health with good nutrition and vitamin supplements. It’ll take a little time and effort but healthy soil will put you on the road to a low maintenance garden. We have seen that ecological awareness is becoming a growing part of landscaping choices for many homeowners in Santa Barbara and Ventura counties. We like to call this trend “going low maintenance.” Conservation is key to this kind of “green landscape.” And conservation means working in harmony with the Santa Barbara landscape with actually lends itself to low maintenance gardening. We have been in the business of “conservation landscaping” for over 40+ years, and during this time we have participated in the ebb and flow of many different landscaping styles. Low maintenance landscaping continues to be one of the most popular and practical ways to go. Furthermore, many homeowners are attracted to the ease of these low maintenance gardens. These gardens have an independent quality—a natural quality that seems to require little in the way of daily cultivation. A garden with healthy soil often seems to be cultivated by Mother Nature herself. We serve Santa Barbara and Ventura counties and are eager to share our expertise with you. Give us a call. We’d be happy to help you develop healthy planting beds so you can create the garden you’ve always wanted!